How many times did Jesus say we should forgive our brother? The Decline and Fall of the British Commonwealth! Here is a first-hand report, from years of observation, on the tragedy that faces Britain and the Commonwealth today. 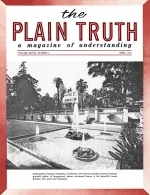 Mr. McNair is Regional Editor in the United Kingdom for The Plain Truth. The future of Britain looks very bleak - as bleak as the two-month old snow and ice outside my window. And this is Britain's worst winter for nearly a century and a half! Britain also recently discovered that it is just as cold on the Continent. The Six gave her a cold shoulder, a chilly "No!" She has been refused admission to the Common Market!